I always say real life is stranger than fiction, but when certain scenarios are replicated it’s eerily emblematic of our society. And we’ve seen the police brutality theme–shoot, punch, strangle first and ask questions later–play out more through the smartphone lens than a movie camera. This time Spike Lee captured how the two worlds collided. The famed filmmaker compared Radio Raheem, a gentle giant character murdered by police in his critically acclaimed “Do the Right Thing” film, to Eric Garner. 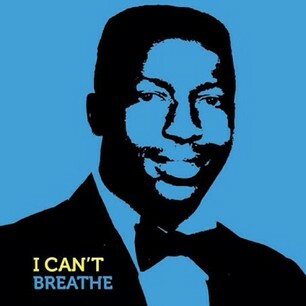 Eric Garner is on the minds and lips of many New Yorkers as the latest victim of police brutality. Not only for the cops overly excessive kneejerk reaction to selling loosies (illegal cigs) but their inability to get the asthmatic father and grandfather help when he needed it most. This is where it gets fuzzy for me. Now that they got this man on the ground, now that he’s silent and stiff, wouldn’t you check his pulse? Not pick his pockets. If you’re wearing a badge that reads “protect and serve,” wouldn’t you utilize that training and perform CPR? Instead of slapping his non-responsive shoulder you CAN wave over the paramedics to revive him. Or better yet listen when he says he can’t breathe. I was hesitant to watch the disturbing video for obvious reasons, but when I finally got up the courage to view it. I instantly thought of my father. How he would break up fights between kids (something Eric was reportedly doing before the police approached him) from me and my sister’s school and talk some sense into them. How he’s a staple to the neighborhood like Eric was to his. And despite that he was still murdered right in front of the community’s eyes. No one helped. Everyone watched him go silent. Now we have to be his voice.